Growing up as a Baptist girl in Texas in the 1960s and 1970s, I knew nothing of the Christian calendar, and Lent was certainly not on my radar. Lots has changed—both in the Baptist world and for me. A good number of Baptists have embraced Lent, and I personally have welcomed gladly this spiritual experience. Mostly I have “given up.” I gave up chocolate one year, not realizing that I would also have to stop drinking my Starbuck’s Mocha—that was not a pretty season of life for me. Last year I gave up Diet Dr. Pepper, and despite predictions from my skeptical daughter, I did it. Forty days without a carbonated beverage! What I have come to understand is that the intent of Lent is not just to give up or take on. The intent is to pay attention. Lent calls us to be attentive to our relationship with God, to our connection with others. Lent also asks us to be attentive to our own our bodies and to our souls. In these weeks of March—as we walk through Lent together—the weekly devotions will focus on what Matthew 7-9 has to teach us about paying attention. For Christmas, my daughter, Alex, gave me a book: Yertle the Turtle and Other Stories by Dr. Seuss. She actually introduced this book to me one Friday night while we were wandering through a bookstore. She knows I love Dr. Seuss, and that night she pulled me over the children’s section and said, “Look, they have Yertle the Turtle.” I was mystified for here was a Dr. Seuss book with which I was completely unfamiliar. Alex handed me the book and said, “Read.” We sat down beside each other—in the middle of a large aisle, legs stretched out in front of us. I held the book, reading each page, making sure she saw all the pictures just like I did when she was two, and that night, Yertle became one of my all-time favorite Dr. Seuss books. But I didn’t buy the book. I had already overspent my book budget for the month. Yertle was Turtle King. Life in his turtle kingdom was pretty good, but then Yertle decided he wanted a bigger kingdom. He wanted a higher throne. He wanted more. And so he called his turtle subjects over and demanded that they stack themselves on each other’s backs. Then Yertle climbed up and stood on top of the pile. But still he wasn’t happy. So he had more and more of his turtle subjects climb on the stack, and Yertle went higher and higher. A turtle at the bottom of the stack finally spoke up, “We turtles can’t stand it. Our shells will all crack. Besides, we need food. We are starving!” groaned Mack. Yertle yelled down to him “You hush up your mouth. You’ve no right to talk to the world’s highest turtle. I rule from the clouds! Over land! Over sea! There’s nothing, no NOTHING, that’s higher than me!” In the end, Mack decided that he had had enough, and with a simple action, he toppled the stack of turtles, freeing them all of Yertle and his enormous ego. And the Great Yertle . . . well, he ended up as King of the Mud. Like Dr. Seuss’ story, Jesus’ Golden Rule demands that we pay attention to how we treat others. Do we climb over people? Do we stand tall while keeping them small? Do we talk down to them, silencing their voices so that ours can be louder? Do we disregard the simple needs of others so that we can retain power and fame? Well, of course, we don’t do any of those things. We are nice people. We treat others well. We cry out against injustice. We root for the underdog. We express indignation against those who are cruel and arrogant. We are good people. But if we pay close attention—if we are attentive to the inflection of our voice, to the roll of our eyes, to our sighs and grimaces, we might just discover that we all have some Yertle in us. In this season of Lent, Jesus’ Golden Rule calls us all to pay attention to our treatment of others, to be attentive of our actions and words. And when we get it right, when we move away from our own Yertle-ness and speak with kindness, act with grace, I just bet Jesus and Dr. Seuss find each other up there somewhere and do a little dancing. 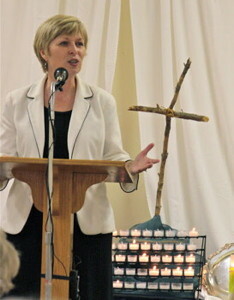 Pam Durso is the executive director of Baptist Women in Ministry, which is based in Atlanta, Georgia. Her most favorite part of this work is walking alongside and encouraging women called by God to ministry. Pam also enjoys researching, writing, and teaching in the area of Baptist history. She teaches Baptist history as an adjunct professor at McAfee School of Theology, and previously served as associate executive director of the Baptist History and Heritage Society and as professor of church history and Baptist heritage at Campbell University Divinity School in North Carolina. Pam earned two of her degrees from Baylor University: a B.A. in religion and a Ph.D. in church history. She and her husband, Keith, live in Lawrenceville with their teenage son and daughter, Michael and Alex. I love the idea of paying attention to the Yertle inside me. I loved this, Pam! You do a super job of taking every day things, like a story, and making a great point – and it is interesting, too! Also personal. I also thoroughly enjoyed the Conversation with Molly Marshall in February. And I look forward to the one this week on Breaking the Law. Pam, this is something I needed to hear today. Paying attention – so important. Thanks for this! Well said!! Straight to the heart. The idea to Pay Attention this Lent really resonates. A beautiful lesson to begin Lent. Praying that I pay attention today.